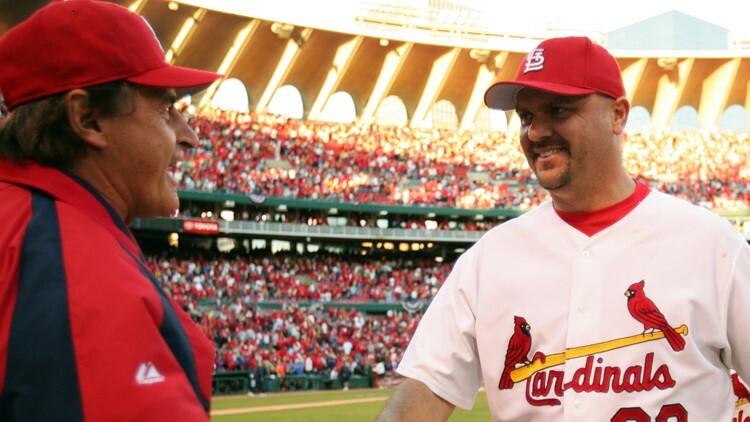 It's too bad St. Louis only got Larry Walker for 144 games at the end of his career. I remember how excited Cardinals fans were when he came here in 2004, giving him a standing ovation in his first at-bat. The greatest Canadian baseball player ever (although Joey Votto will soon claim this title) is one of the most well-rounded players in the last quarter century of this game. In his penultimate year of eligibility, it seems voters are starting to come around on what should be a fact. Larry Walker is a hall of famer. According to ballot tracker Ryan Thibodaux, Walker currently (As of January 15) appears on 66.7% of the revealed ballots. Last season he garnered just 34.1% of the vote, falling well short of the needed 75%. The two biggest stains on Walker's resume are his primary home ballpark (Coors Field), and his inability to stay healthy, averaging just 110 games a season in his 17-year MLB career. Walker was a five-time All-Star, a three-time batting champion and a seven-time Gold Glove winner. He finished he career with 2,160 hits, 383 home runs .313/.400/.565 slash line. The guy was the definition of a "five tool player". As Fangraphs writer and Hall of Fame expert Jay Jaffe puts it, "Had he done it for longer, there’s little question that he’d be en route to a plaque in the Hall of Fame". Even with the inflated numbers at Coors Field, the many injuries and noted lack of "career defining moments", Larry Walker should be in Cooperstown. Many writers are starting to come around on this notion, just as Walker's eligibility is nearing its end in his 14th year on the ballot. The recent support for Walker comes thanks in part to the ballot opening up with fewer "slam dunk" candidates, as well as a deeper dive into and greater appreciation for sabermetrics. Walker likely will fall considerably short of induction once again in 2019, but this late burst of support should eventually carry him in. If not in his final year in 2020, then certainly by the "Today's Game" committee somewhere down the line. Even if he fails to make it to Cooperstown, the affable superstar did provide us with one of the funniest moments in baseball history. And that should be good for something, too.